If you want to crunch those large FLAC files to mp3 and are looking for a quality audio converter, try ftransc. The advantage to ftransc is its ease of use from the cmdline. There is no need to be an audio expert. Using presets make ftransc very simple to use. It comes with a Qt based GUI as well. And if you are a Rhythmbox fan then you also have a ftransc plugin. It integrates with Nautilus as well. ftransc is written in python and uses several audio libraries for conversion and metadata handling: Mutagen (for metadata), ffmpeg/avconv, LAME, FLAC, vorbis tools, faac, Musepack, PyQt, CDparanoia, WavPack. As you’ll see, the last command will pull a lot of dependencies. If you do not want the Qt GUI (ftransc_qt) you can edit the Makefile and remove python-qt4 from the apt-get line. This will download less than 3MB of packages as all Qt related dependencies won’t be installed. 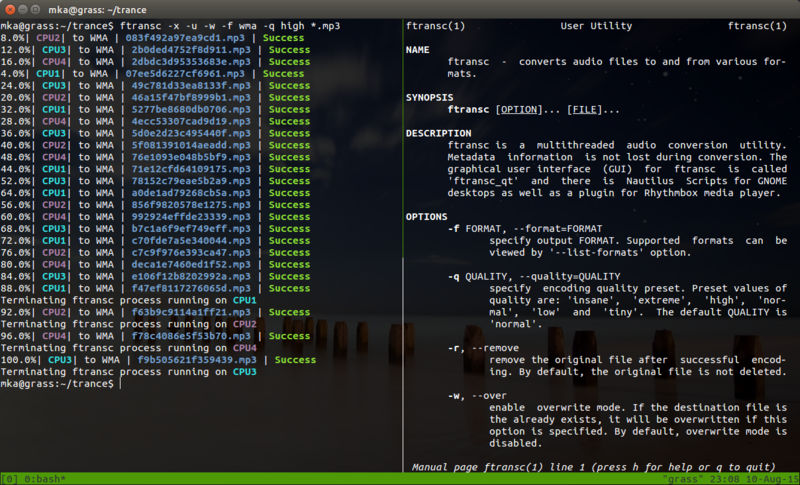 Right click on any audio file in Nautilus and you’ll find ftransc under Scripts menu. To integrate into Rhythmbox, enable ftransc Audio Converter in the plugins list, right click on any track and select Convert Songs (ftransc). Take a look at /etc/ftransc/presets.conf which has the presets for each codec. The following levels are configured (from best to lowest quality): insane, extreme, high, normal, low and tiny.